Jeff Groudan, worldwide director, Thin Client and Virtual Workstation Product Management and Jim Christensen, product manager at HP, talked about the announcement this week of the HP DL380z Virtual Workstation solution that is a combination of HP’s server hardware technology and the integration of it into the true workstation ecosystem, delivered out of the Workstation Business unit. The HP DL380z Virtual Workstation combines the HP server technology, NVIDIA virtualization technology and Citrix virtualization technology. Workstation virtualization computes the graphics while the data remains in the data center, and sends screen shots down to the end point. The product delivers a lot of benefits such as locking down and securing the data in the data center and never reaching the end point. For oil and gas clients, they want the data stay in the data center where there are big pipes between the storage and the CPU and GPU. There is a real performance benefit by having that kind of data proximity,” said Groudan. For oil and gas customers, there is a benefit for the huge datasets and data models where you can take as much time for the data to reach the end point as it took for the data to actually do the work. “By having that data back where the CPU and GPU are, it gives you the opportunity to accelerate the performance and get better, faster response time and results,” Groudan said. “There are datasets the customers don’t want in the public domain. The HP DL380z serves an extension of the Virtualization solutions from HP that are designed for work flows in the fields of CAD, engineering, architecture and construction, geospatial, oil and gas exploration, government and digital media. 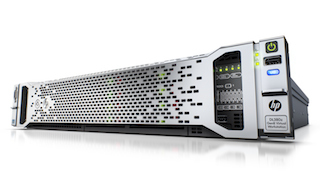 The HP DL380z uses ILO Integrated Lights Out) centralized management in an industry-standard 2U rack workstation form factor. This form factor is small with good density but still big enough to bring in key graphic cards and the right amount of CPU and storage for the use cases. One rack will support between one and 8 users on one workstation. For the data center workstation experience, the HP DL380z makes use of the dual NVIDIA GRID K2 graphics cards and NVIDIA GRID GPU virtualization, supporting up to 8 users on a single workstation. Other graphics cards – the NVIDIA Quadro K6000, K5000, and K4000 are also supported. The compute engine is co-located with the high performance storage arrays in the data center that makes drastically reduced project load times. 1) The most demanding use case: remote workstation or 1:1 use case. No virtualization. You have an individual connecting remotely to the HP DL380z who is utilizing all the resources of that workstation, so one person to one virtual workstation. A guy sitting on an oil platform may be looking at detailed seismic information and he needs CPU and GPU to crunch that model. 2) Pass through GPU is a slightly more moderate type use case instead of one person you might have 2-4 users accessing a single Virtual Workstation. Where the CPU resources are virtualized, you’re sharing CPUs in cores. But you get direct access to your own GPU that is not being virtualized, where the CPU not as heavily used, but you need a dedicated graphics core. 3) Virtualized GPU will have a full 8 users using a full HP DL380z. “We’re virtualizing both the CPU and the GPU to share resources to up to eight users,” said Groudan. Mainstream, product design, or architectural, CAD or collaboration are areas where sharing is an okay way to deploy the Virtual Workstation. The HP DL380z is certified for the Citrix virtualization stack that includes the HDX 3D Pro technology, that ensures high-performance remote access to workstation-class applications, according to the press release. HP Remote Graphics Software (RGS) is also supported by HP DL380z, providing the ability to host collaboration sessions from multiple devices and multiple operating systems including Linux. The latest release of RGS gives users the ability to get workstation productivity from a tablet and brings touch controls to the non-touch applications. Pricing is available upon request and the HP DL380z will be available the beginning of June. This entry was posted on Friday, May 9th, 2014 at 9:59 am. You can follow any responses to this entry through the RSS 2.0 feed. You can leave a response, or trackback from your own site.